The 2010s is a time of the rise of digital music comparing to physical (CD, DVD, Vynil). It often happens that streaming services and cloud storages are the best solutions for music lovers. Think for yourself, why have a separate device when you can just download an app, and that's it. Many music streamers offer web players, which are a bit different from desktop apps, allow users to completely integrate with social networks eliminating a need for downloading an app, and, generally, we can do everything in a browser. Today, I'm comparing two players, namely Spotify Web Player and VOX Music Cloud for VOX Player. They both help people enjoy their favorite music but in different ways, which makes them so interesting to study. Spotify is one of the apps that doesn't need an introduction. But if you still live in The Stone Age and are dumb as a rock, Spotify is a streaming music application that lets you listen to millions of songs for a relatively small price. Although there are various streaming services, like Tidal, Apple Music, Google Play Music and so on, Spotify seems to have gathered the most music lovers, and one of the key reasons for that is that they have a broader access to music, namely the Spotify Web Player. This feature came out a few years ago, but many still haven't used it. Today, I'm taking a closer look at both pros and cons of Spotify Web Player, and then you can decide for yourself whether to use it or not. The Desktop app is easy to use. But what if you travel a lot or use different computers all the time? Using Spotify Web Player, it matters not where you are. You can get access to your library with any browser, regardless whether you're at home, work or some party. You just log into your account using your account name and pass and listen to music straight away. Extremely useful. Something that the desktop app doesn't have. A beneficial thing especially if you have no time or will to switch between the apps just to play the next song. You enable hotkeys you need to download the extension for Chrome or add-on for Firefox. With a new Web API, you can integrate Spotify content into Facebook, Twitter, and other website and social network. It's a good way to share music with friends and recommend something to listen to. A major problem that lots of users face is an overcomplicated design that makes you google 'How to...' questions. Luckily, it's not the case with Spotify Web Player. 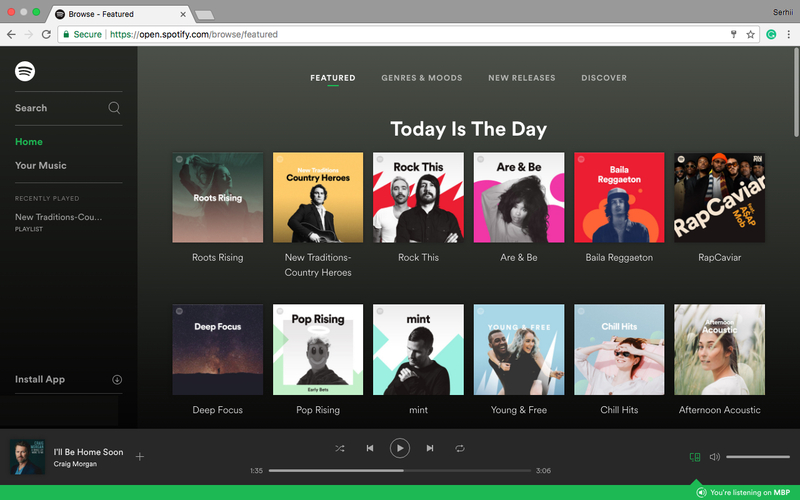 In a browser, Spotify looks just like the desktop app without radio and some other function, but, overall the interface is same easy and understandable. Accessibility is both its strongest point and its main disadvantage. Once you close a browser, the player's gone. If it crashes, it's gone. If you go to Sleep mode, it's gone. It's very annoying, but it's the price for non-app listening. All streaming services including Spotify are famous for having gigantic music collections and low sound quality. Spotify app streams music at 256 kbps in OGG Vorbis. The Web Player has the same music collection but at 160 kbps. It's twice worse than typical MP3 320 kbps. However, as I believe, this quality is also far from perfection. Both desktop and mobile app have options for offline listening. They include downloading and storing some songs. However, Spotify Web Player doesn't. It's pretty logical that a WEB player can't play without the Internet connection, but still, we want it. Providing you have extra 50 MB, don't be lazy and download the app. First, it includes much more options than the Web Player, and second, it runs more smoothly. VOX Cloud is an online music cloud that works with VOX Music Player to store and play all your music regardless of the files format or size. Although I spoke about a web player before, I'm aiming to make a point why a desktop app is better than any web player or streaming service. 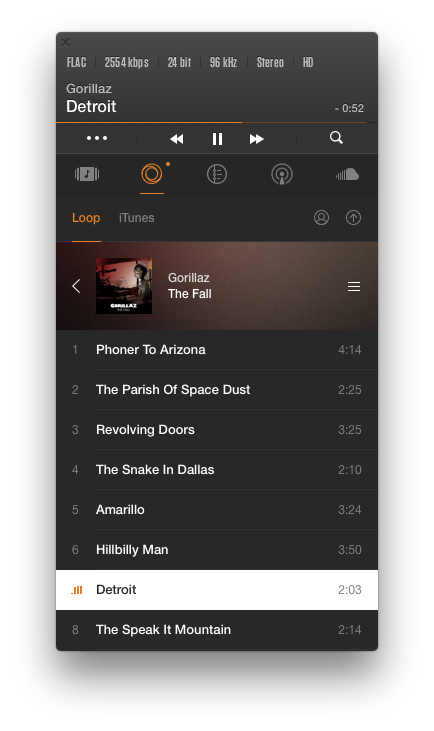 LOOP is also somehow a streaming player, with the difference that you can listen only to songs you uploaded beforehand. How is VOX Cloud different from other music apps? VOX Cloud is an Unlimited music cloud. It means you can upload thousands or even millions of songs. The more you upload, the bigger library you have. Think about the quality. Spotify, Apple Music and Google Play Music stream at 128-256 kbps in OGG, AAC and MP3 correspondingly. They all are lossy audio formats. VOX Cloud has no restrictions to formats of audio files. It's the best way to listen to High-Resolution music for you can upload FLAC, ALAC, WAV, AIFF, PCM, etc. with no compression or conversion (Google Play Music allows you to upload any format but eventually converts it to MP3). How it works with VOX: You upload FLAC 4096 kbps/96kHZ - you listen to it. You must first download VOX Music Player for Mac & iPhone, sign up for VOX Premium and then you can start uploading your entire collection into VOX Cloud. Having done that, you can enjoy all your music, anytime, anywhere. Moreover, if you're not good at creating playlists, you can sign up to Spotify and SoundCloud accounts to combine all three sources of music in VOX. It's an essential feature as Hi-Res audio has finally become a favorite in the world of music. More and more do we pay attention not to the quantity but the quality, and it's beautiful. With VOX, you can have all your music library and not question yourself if there's enough space. I have a massive Hi-Res collection and whenever I want to find new music I go to SoundCloud tab. More on that below. The full list is too long, but among the famous one are ALAC, FLAC, WAV, AIFF, APE, PCM, DSD, CUE, AAC, OGG, MP3, M4A, etc. I honestly doubt you can find a format not supported by VOX. Hail to the quality. It's true. Once you upload something to VOX Cloud, it becomes available for listening on all devices connected to your VOX account. That's one of few ways to listen to Hi-Res files on iPhone. Your iPhone's never sounded like that before. That is a necessary feature because no matter how big your music library is, you always crave new songs and artists. To satisfy this need, VOX Player features streaming services integration so within one app you can have access to SoundCloud, Spotify, and Last.fm. You can add any song from any service to your playlists to create unique playlists, and signing in to Last.fm helps you keep your listening stats up-to-date. VOX Cloud works with Internet data (3G, 4G, LTE) or Wi-Fi. However, when you might not have either, you can download song tracks or albums to listen to them offline. The quality remains the same, but mind that Hi-Res files take up lots of space. 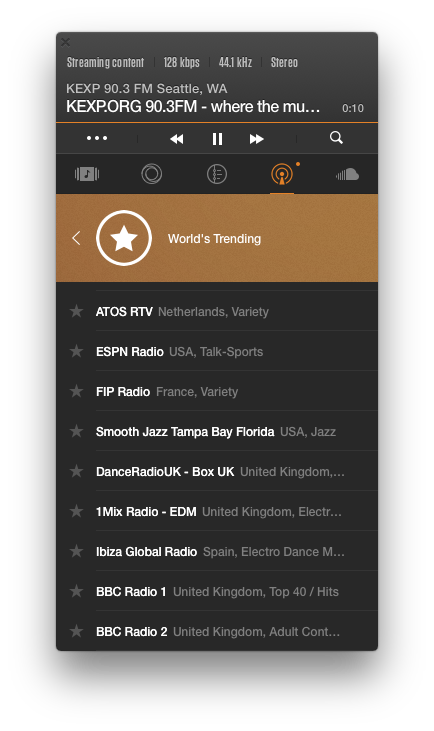 Radio is an in-app purchase that unlocks 30,000 radio station from all over the world. They include some local one, as well as most famous one like KEXP, BBC One, BBC 6, KPCC and the rest. Unlike most streaming services, VOX Cloud is available no matter where you are. It's a great solution, especially if you like to travel or live outside Europe and the Americas. Both features are used to improve the sound when using headphones. EQ includes over 20 presets for different genres and BS2B makes the sound as if you were listening to it in a studio. I should say that it takes some time to find and upload files to Cloud, but even if you have a 1 TB library, you can upload everything within a few hours. I managed to upload 5 GB of Hi-Res music in 7 minutes. You can check where to find Hi-Res files. Although tastes differ, I prefer VOX myself. The key reason is that I appreciate the quality of sound, and now that I've uploaded 150 Hi-Res albums and connected my SoundCloud account to discover new music, VOX seems to be a perfect app for high-quality playback combined with huge SoundCloud collection. Caught between two stools: what is the best audio player for iPhone?